Forex Time (FXTM) is a MetaTrader broker that offers forex and CFD traders multiple account options for both MT4 and MT5 platforms. 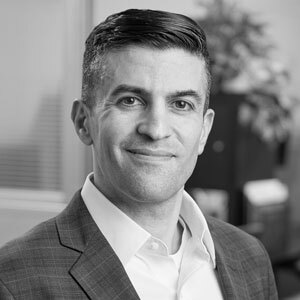 Although some of its products are segmented by account type, the broker has fair pricing and competitive spreads in its Pro and ECN accounts. Please Note: ForexTime (FXTM) was not included in the 2019 annual review. As a result, this broker's ratings may be outdated. 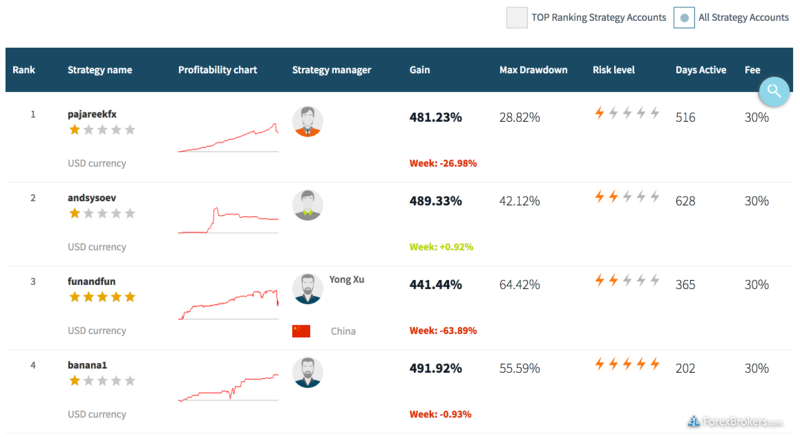 Read our Best Forex Brokers 2019 guide for a look at the top rated forex and CFDs brokers. Forex Time (FXTM) was founded in 2011 by forex industry veteran Andrey Dashin, who is also a key shareholder of the online broker Alpari. Since FXTM’s launch, the broker has expanded its platforms to include the suite of trading applications developed by MetaQuotes Software Corporation, which includes MetaTrader 4 (MT4) and MetaTrader 5 (MT5). Today, FXTM remains a MetaTrader-only broker and offers seven account types that provide traders with access to 59 currency pairs as well as CFDs on 173 single-stock shares, 11 indices, six metals, three energy contracts, and three cryptocurrencies. The broker also provides social copy trading through its FXTM Invest offering. The FXTM brand has obtained regulatory licenses in several jurisdictions, including throughout the EU via its CySEC-regulated brand in Cyprus under ForexTime Limited. It was also licensed in South Africa by the Financial Services Board (FSB). In addition, FXTM is regulated in Belize by the IFSC under its FT Global Limited entity. In 2018, FXTM obtained regulatory status in the UK with the Financial Conduct Authority (FCA), under its ForexTime UK Limited entity. Here at ForexBrokers.com, we maintain the largest independent regulatory database available on the web. Using 28 different variables, we have created a proprietary 1-100 score (the higher the better) of overall trustworthiness, which we call the Trust Score. Here is our trust summary of ForexTime (FXTM). 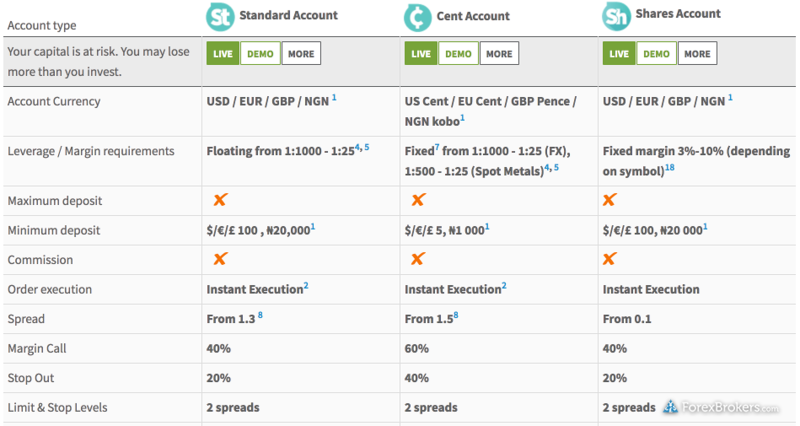 The following table summarizes the different investment products available to ForexTime (FXTM) clients. FXTM offers seven different accounts types where the execution method, range of markets, available platform, and commissions and fees may vary. Behind the Pro account, spreads are lowest on the ECN account. Three accounts are offered under the Standard category, in which the execution method is instant. These include the Cent account for forex and metals trading, the Standard account, which has lower comparable spreads for forex trading and less restrictions on max trade size, and the Shares account for single-stock CFDs. 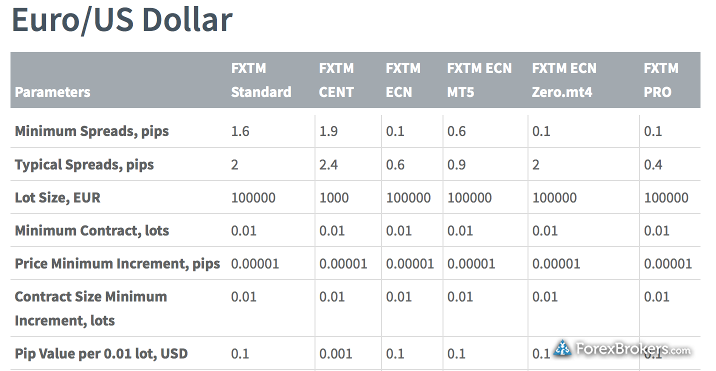 However, FXTM’s most competitive offering in terms of trading costs is on its four other account types, including the commission-based ECN Account, the ECN MT5, the commission-free ECN Zero account, and finally the FXTM Pro account for traders who deposit at least $25,000. On the commission-based (ECN) accounts, the Round Turn (RT) commission is $4 per 100,000 units (one standard lot) based on $2 per side per standard lot. After the Pro account, the next lowest spreads are on the ECN account. For example, in the ECN Account, FXTM lists typical spreads of 0.6 pips on the EUR/USD pair, which means the all-in cost is 1 pip after factoring in the RT commission equivalent of 0.4 pips. FXTM provides research in the form of daily technical and fundamental news analysis from its in-house team of analysts, who post blog updates and daily videos as well as a quarterly market forecast report. Twice daily, FXTM provides trading signals on over a dozen instruments, including eight currency pairs with stop-loss and multiple take-profit levels. 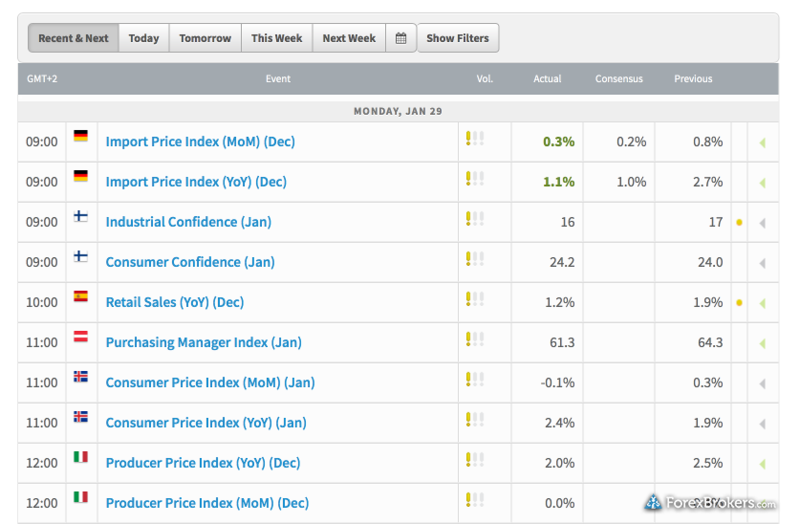 The broker provides an economic calendar powered by FXStreet, which also streams the news headlines in its platforms and website. Twice daily, FXTM provides trading signals on over a dozen instruments, including eight currency pairs with stop-loss and multiple take-profit levels. This offering is powered by the firm’s in-house staff and includes scenario analysis. It also uses three technical indicators for additional confirmation, and is displayed via the client web portal. FXTM is a MetaTrader-only broker offering the standard, out-of-the-box experience. This means it offers the suite of platforms from MetaQuotes Software Corporation, developer of the popular MT4 and MT5 platforms for desktop, mobile, and web. To learn more about MT4 and MT5, read our full MetaTrader Guide. While MetaTrader 4 and MetaTrader 5 come standard, with little variation in functionality from broker to broker, significant differences exist in how the platform is set up for trading spreads and commissions, execution, and other tools, features, and administrative areas. Separate from the native signals markets in MetaTrader, the broker offers additional auto-trading via its FXTM Invest platform, with over 750 strategy providers to follow. 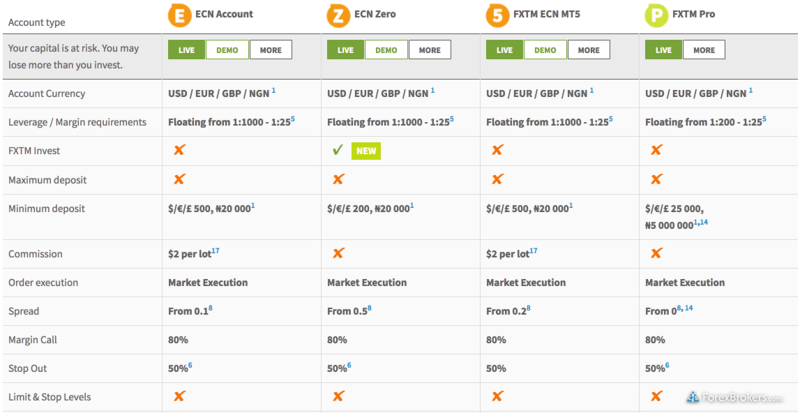 These can be used only with an ECN Zero account via the myFXTM portal. Since FXTM is a MetaTrader-only broker, iOS and Android versions of the MT4 and MT5 app come standard and are both available for download from the Apple iTunes store and Android Playstore, respectively. 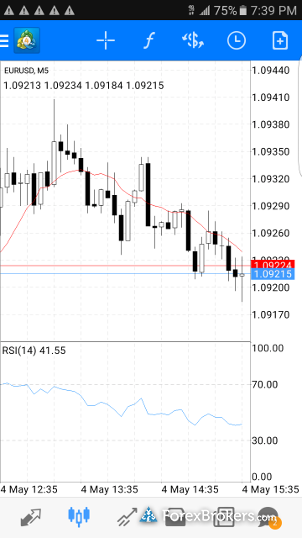 For more on the apps, read our MetaTrader Guide. While FXTM also has its own mobile app, this is for account administration to sync with the MyForexTime portal; no trading can be conducted on the app. In 2017, FXTM launched CFD trading on cryptocurrencies including Bitcoin, Litecoin and Ethereum, helping the broker cater to the increasing interest in obtaining exposure on digital assets. FXTM’s offering for Bitcoin as a CFD is fair with a max trade size of 5 bitcoins; however, it falls short with weekend trading, which is not yet available. It is worth noting that on all market execution accounts (ECN), stop-loss and take-profit levels can only be added after the market order is executed. This restriction limits a trader’s ability to use the pending order feature, as stop-loss and limit levels cannot be added in advance. An alternative to this is to use the other three (Standard) account types, which follow instant execution where this limitation does not apply. In terms of leverage, there are tiered levels for margin depending on trade size, per account, comparable to tiered levels other brokers use. FXTM provides traders with multiple account options where there are pros and cons to each, ranging from margin to execution method, variety of markets, and pricing. For example, one of the pros of the ECN accounts is more competitive pricing, yet the stop-loss and limit levels can be added only post-execution, compared to the standard accounts. In addition, traders wanting features from more than one account would need to open multiple accounts, such as in the case of trading single-stock CFDs and forex, as these cannot be done from the same account. All in all, for traders who know exactly what they want to trade and which trading conditions are most important to them, FXTM provides multiple options for MT4 and MT5. Adding cryptocurrency CFDs beyond just bitcoin was also a positive addition to FXTM’s offering, despite the limitation of weekend trading being unavailable. traders with less experience might have a hard time deciding. Ideally, we would like to see some of the account features combined; for example, it would be useful if FXTM centralized its multi-asset offerings from different markets into one place. Lastly, the broker fares better for research with its own auto trading platform and in-house signals. Select one or more of these brokers to compare against ForexTime (FXTM). *ForexTime did not participate in the 2017 Online Broker Review, as a result the following data may not be up to date. Trading costs, including spreads plus any commissions, will vary at FXTM depending on the account that is established. The firm also has less favorable margin rates on its Pro account, where leverage is capped at 200:1 for trades up to five million units. On its other ECN accounts, the same leverage can be obtained up to six million and even higher leverage for smaller trade sizes, making the Pro account less flexible for larger positions. Finally, the threshold for when a stop out liquidation is triggered increases from 50% to 100% for ECN accounts in the hour before the close of trading on Friday. This would affect traders holding positions through the weekend as a stop out could trigger more easily. Find out how ForexTime (FXTM) stacks up against other brokers.